Can You Create a Landing Page in Constant Contact? Website Planet > Blog > Landing Page Builders > Can You Create a Landing Page in Constant Contact? If you want to create a landing page that is fully integrated with your email marketing campaign, it’s worth checking out Constant Contact. Specializing in all things email marketing, Constant Contact helps its members create a variety of email landing pages. These are essentially single webpages that can be distributed to your mailing list, encouraging your audience to take specific action. 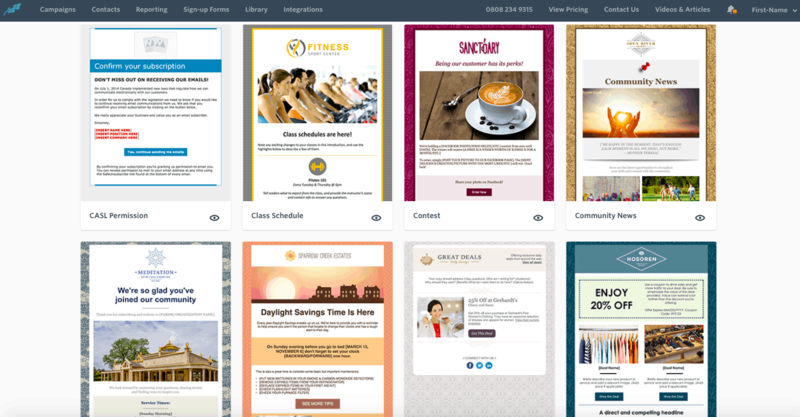 You can choose between dozens upon dozens of templates, each of which has been expertly designed to prompt conversions. 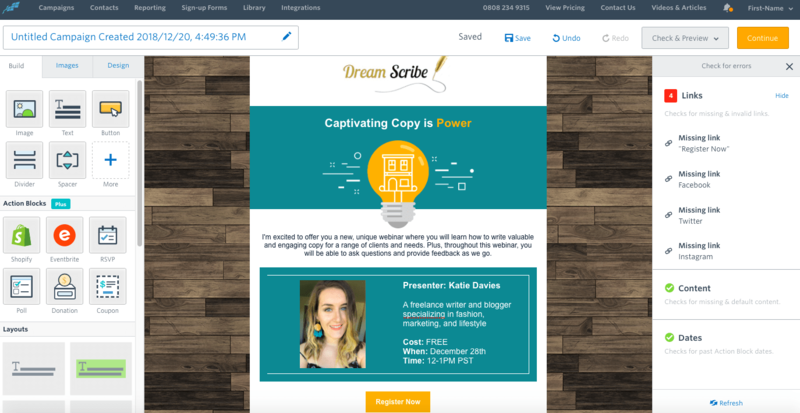 You’ll find the email type you are looking for, whether you want your audience to register for an event, enter a contest, or download your latest ebook. It’s true that your options are limited with Constant Contact, as the pages have truly been designed to be the body of an email vs. a standalone landing page. If you’re looking for more versatility, or you want to create a fully customizable landing page, we recommend heading over to Wix or GetResponse. However, if you’re looking to boost your email marketing strategy—while increasing conversions—Constant Contact might be precisely what you need. And the creation process couldn’t be more straightforward. First things first: sign up for an account with Constant Contact and verify your email address. At this point, you will be taken to an initial screen where you can start building your email campaign. Browse through the Constant Contact gallery to select your email landing page template. This process might take some time as there are currently hundreds of templates on offer. Each one can be customized to suit your needs. Pro Tip: Defining the core goal of your campaign will help you determine which features will best serve your needs. 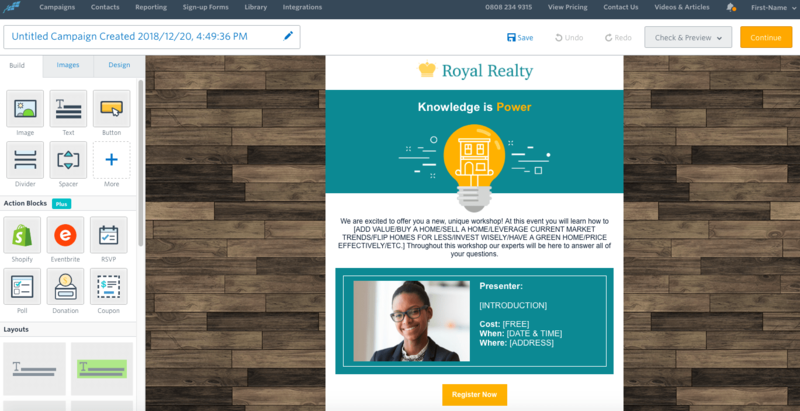 For example, the functionality of the landing page will change depending on whether you want to increase sales by providing a coupon or drive web traffic with a new blog post. Adapt your chosen template to match your branding in terms of colors, fonts, language, and overall style. 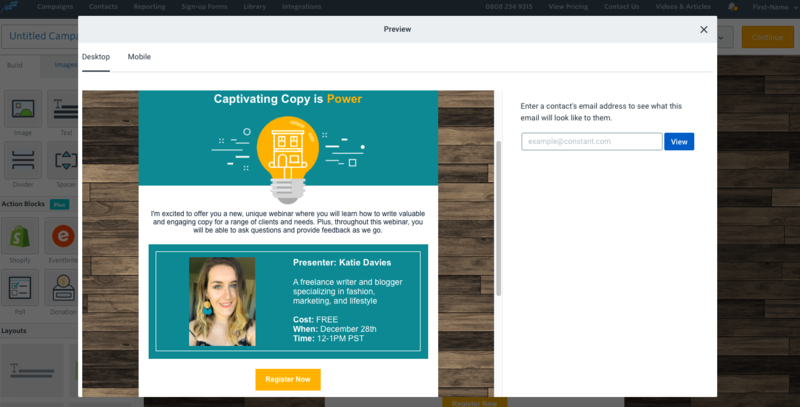 You can use content “blocks” to create a bold, personalized message (ActiveCampaign users will be familiar with this method). Simply insert different content types as individual elements from the tabs on the left-hand side. Basic: Click on the corresponding blocks to place an image, text box, button, divider, or spacer into your template. Action Blocks: Choose to integrate Shopify to create a Point-of-Sale, Eventbrite for ticketing services, or the RSVP tool to manage responses to event invitations. You can also use the Poll tool to gain customer feedback, the Donation option to accept donations, or offer your customers special discounts with the Coupon tool. Layouts: Visualize the different layout options that you can apply to your template. Images: Proceed with the easy-to-follow on-screen instructions to upload images from your desktop or through an image URL. 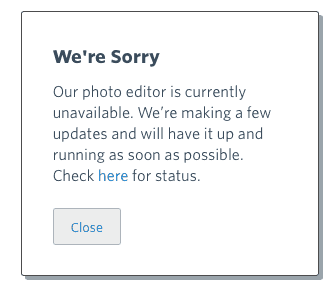 In our test run, we experienced frequent issues with the photo editor tool. This kind of thing can make the image insertion process rather frustrating. Design: Change different elements of your landing page layout, including background graphics, fonts, and colors. The platform is very intuitive. 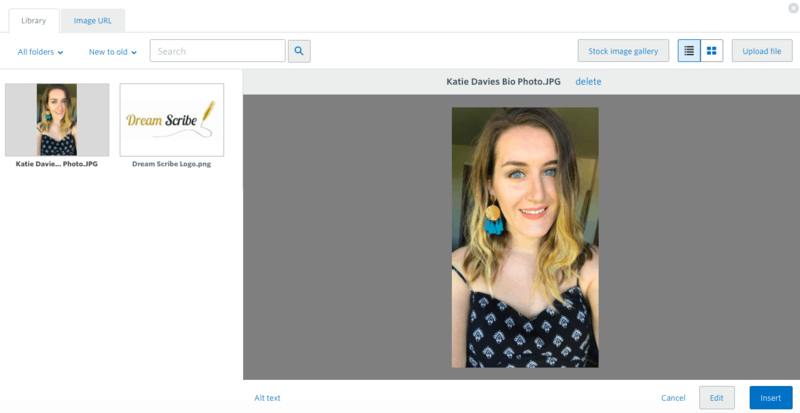 You can drag and drop any element, or click to edit the text directly on the template. This functionality makes Constant Contact very similar to ActiveCampaign, GetResponse, and Wix, all of which also offer a user-friendly creation process. Once you’ve finished creating your masterpiece, you can view your template from a desktop or mobile perspective to ensure that it has been optimized for all devices. However, unlike Wix, Constant Contact doesn’t allow you to edit your design in Mobile mode. Pro Tip: Make sure your fonts are big enough to be read on a mobile device. Break your text up into sections to make it easily digestible across all devices. Once you’re happy with your design, click the “Check for errors” button to check for any missing or invalid links before you send out your email. Fix any errors before clicking “Continue.” You’ll then be taken to a screen that asks for more information about your campaign. You can now send out a test email to up to five recipients. 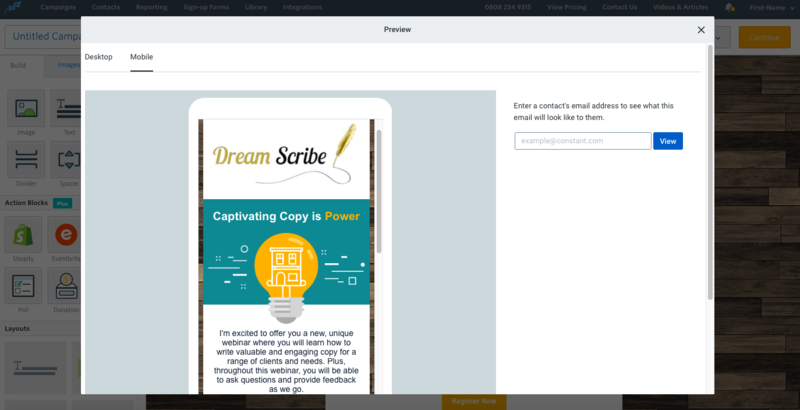 This is a handy feature, as it allows you to make any necessary adjustments before rolling out your email landing page to your entire email list. Once you’ve sent your campaign, you can navigate to the “Reporting” tab to measure your results. This allows you to track the success of your email landing pages through Constant Contact’s real-time reporting tools and analytics. You can find out when and where people are opening, reading, clicking, and forwarding your email, who they are, and whether they’re on a desktop or mobile device. These insights can then help you tweak your marketing campaign and optimize your landing page template to improve your results next time around. Who Should Create Landing Pages with Constant Contact? The biggest drawback to using Constant Contact is that every feature is specifically designed to be integrated with its email marketing campaigns. If you’re interested in creating landing pages that aren’t necessarily linked to an email marketing campaign—a landing page to link to from your social media pages, for instance—you’re better off with a platform like Wix or GetResponse, which you can use to create any type of landing page. Unfortunately, there is no free account option. However, if you’re currently located in the U.S. you can get a 60-day free trial, no credit card number required—but keep in mind that this trial period comes with significant service limitations. Users in other countries get their first month free when signing up for the service. Your account will be fully functional during this free month, but you do have to enter your credit card details to sign up. 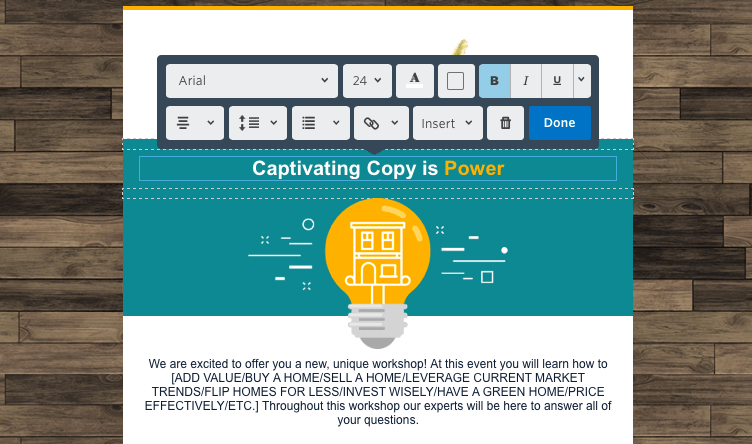 Generally speaking, Constant Contact makes it easy to produce gorgeous yet practical email landing pages. However, due to the platform’s various restrictions, it’s probably best suited for email marketing beginners, startups, and small businesses who are just beginning to grow their email lists. If your business is already well-established and you’ve been engaging in email marketing for quite some time, you might want to consider purchasing the Email or Email Plus account. Alternatively, you may be better off choosing a service that specializes in different types of landing pages. Constant Contact claims that for every $1 spent on your email marketing campaign using the platform, you will gain an average ROI of $38. That is pretty tempting, but it’s ultimately up to you to decide on the best path to reach your marketing goals.